MIDWIL Trading Inc. - Qatar has been awarded the project Maintenance of Traffic Signs and Safety Devices Throughout Qatar - Contract 6 from Public Works Authority (ASHGHAL). The work consists of carrying out regular inspection, repair and rectify damaged components of all types road safety devices, investigate and suggest locations where safety devices are missing or require improvement, reporting for further action in order to keep all safety devices of area updated and free of accident damages throughout the contract period. MIDWIL Trading Inc. - Qatar has been awarded the subcontract work for Al-Sarh Trading & Contracting Co. W.L.L. for the project Access Road to Al Karaana PTP from Public Works Authority (ASHGHAL). The work consists of supplying and installing Crash Barrier System and End Terminal. UK-based HighwayCare Int. (HCI) recently had its BarrierGuard system installed on the Salwa International Highway in Doha, Qatar, by local partner Midwil Trading (MT). MT has the Ashghal (Qatar Road Authority) contract to undertake maintenance and safety measures on all the state’s primary routes. MIDWIL Trading Inc. - Qatar has been awarded the project Supply and Installation of Chain Link Fencing at Truck Parkign Areas from Public Works Authority (ASHGHAL). The work consists of supplying and installation of Chain-link Fencing System and Gates for five different locations. MIDWIL Trading Inc. - Qatar has been awarded the project Provision and Maintenance of Safety Barriers & Fences Throughout Qatar, Contract 1 from Public Works Authority (ASHGHAL). Work includes the provision of all required materials and installation work related to the proper repair, maintenance, update and improvement of all types of vehicle and pedestrian safety barriers, safety fences and other traffic safety measures throughout the specified area. MIDWIL Trading Inc. - Qatar has been awarded the project Provision and Maintenance of Safety Barriers and Fences Throughout Qatar, Contract 1 from Public Works Authority (ASHGHAL). The work consists of provision of all required materials and installation work related to the proper repair, maintenance, and improvement of all types of vehicle and pedestrian safety barriers, safety fences and other traffic safety measures. 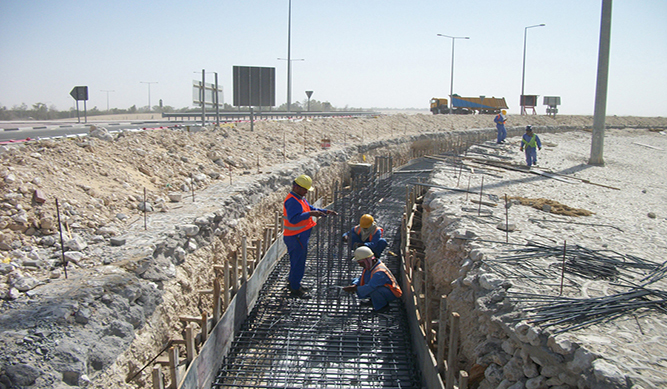 MIDWIL Trading Inc. - Qatar has been awarded the project Provision and Maintenance of Safety Barriers & Fences Throughout Qatar - Contract 2 from Public Works Authority (ASHGHAL). The work includes the provision of all required materials and installation work related to the proper repair, maintenance, update and improvement of all types of vehicle and pedestrian safety barriers, safety fences and other traffic safety measures throughout the specified area. MIDWIL Trading Inc. - Qatar has been awarded the project Maintenance of Safety Devices and Traffic Signs Throughout Qatar, Contract 3 from Public Works Authority (ASHGHAL). The work consists of carrying out regular inspection, repair, rectify damaged road safety devices, improve all warning, regulatory and information traffic signs and pedestrian fencing/guardrails. Which started only as supplier of world-class and reliable engineering products, MIDWIL has made way in the business of contracting and installation as a result of the demand and trust of local and international contractors in Qatar. MIDWIL’s skillful and motivated engineering team ensures safe, high-quality, and complete-on-time delivery of services. To-date, we have completed more over 140 projects in a span of 9 years demonstrating the company’s ability to deliver services with optimum results while meeting clients’ needs. • Specifically developed to manage installation process of materials. • Proven to deliver highly reliable installation services to clients, with combined knowledge and experience gained through the years. • Driven by results which is guided by company values, that leads to competitive performance. • Highly reputable company trusted by local and international contractors. • Skilled and tenured engineers and personnel.